Dale has been working for the past 28.7 years with the Kansas State Department of Education. 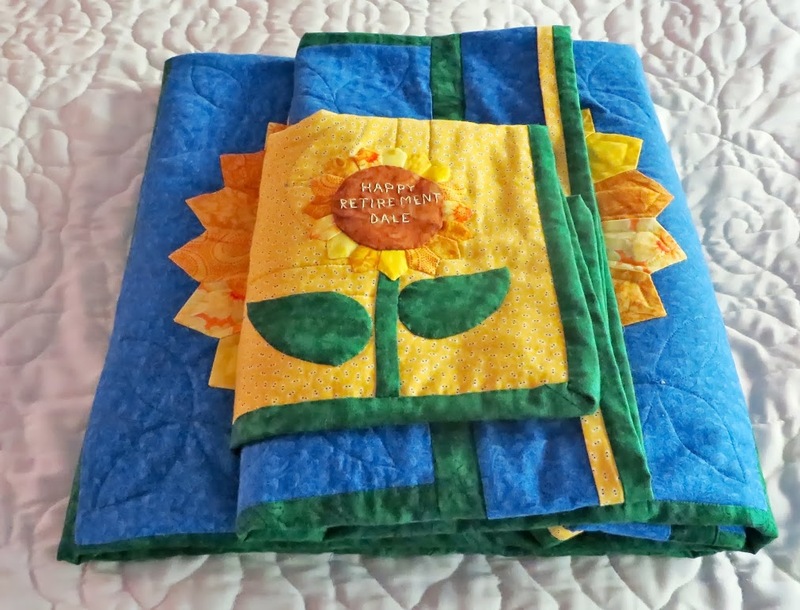 And so round about mid-August I found a great tutorial on making Dresden Plate Quilts online that made me feel full of confidence that a Sunflower State retiree could actually have a sunflower Dresden quilt. So off I went to get a Dresden ruler and my fabric palette. I actually had the brown fabrics already. 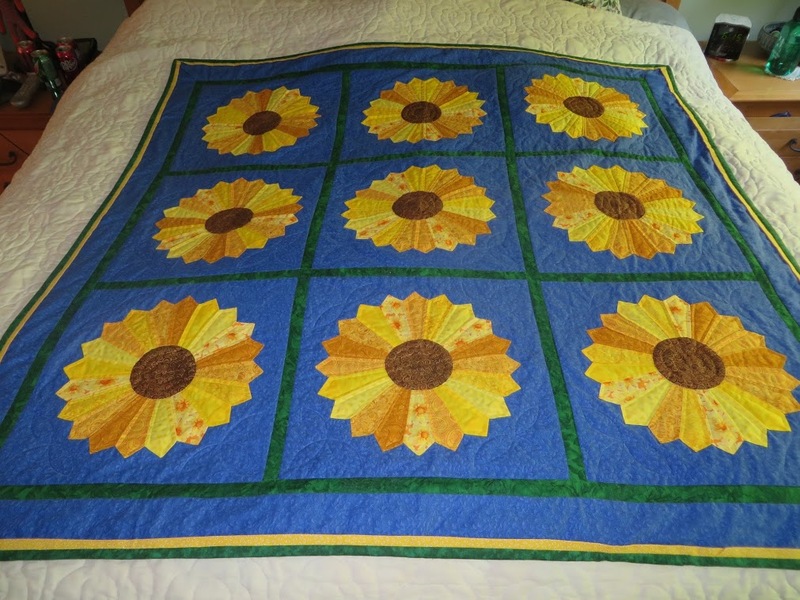 And for the front of the quilt I made up 9 sunflower blocks. Mine were 17 inch blocks, which sounds like a weird number, but actually with the borders came out to a nice 60 inch square lap quilt. And here the front is.. in all its sunny glory! Now here’s why the spy parts come in…. 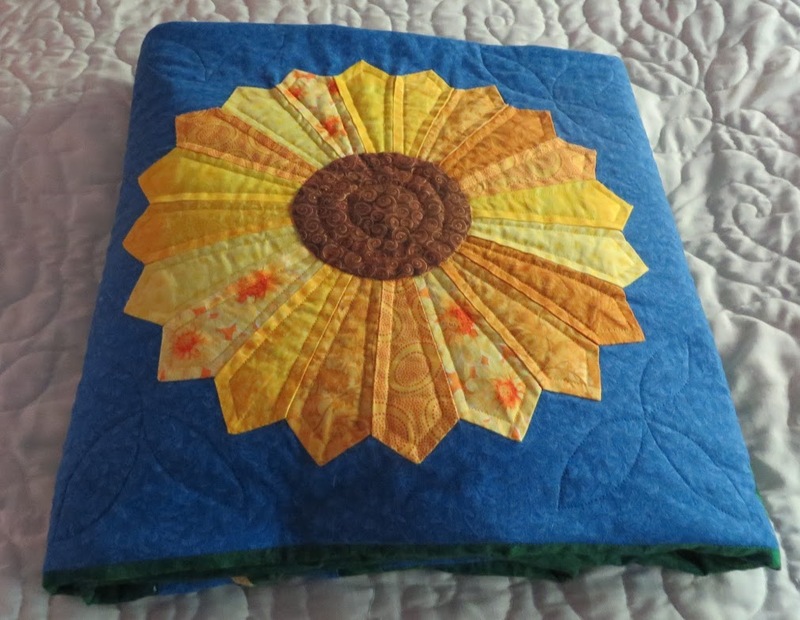 I decided that this should be a secret project, but I wanted to tie in her work with the quilt… so I called her boss (ok I got the assistant to her boss) who patched me through to another co-worker that became my agent on the inside. She hooked me up with a fine selection of photos, which I added to the back of the quilt. This is also a good view to see how I did my quilting lines! The picture rail on the back brought the yellows and the blue from the front to the back.. and then a small pip on the front, brought some of the backing yellow forward. I did get a bit lucky in places where I quilted through the picture rail. With some creative folding presentation, front of a single square, and the tag got a highlight too! I really do need to thank my agent on the inside. 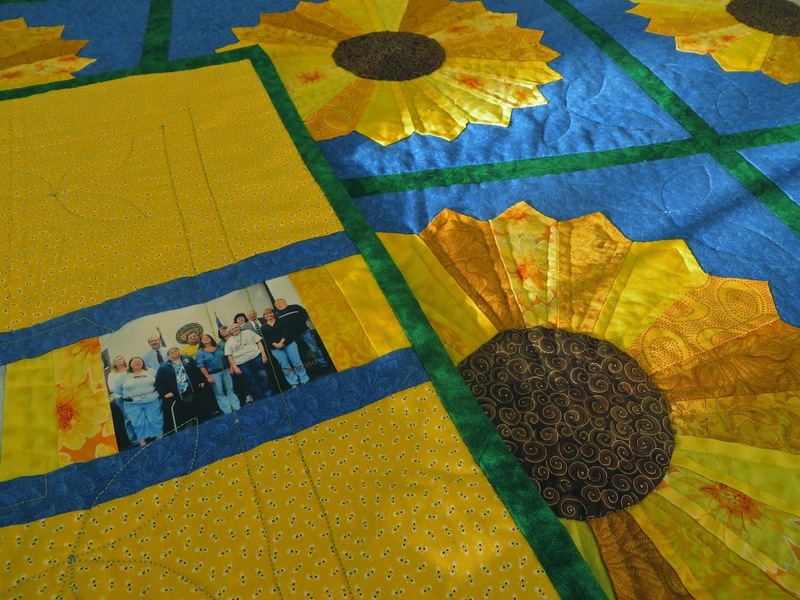 The quilt was mailed on Monday, with expectation of arriving Friday in time for the party they were having. For whatever reason on Monday I was thinking was an after work thing, and after a few more conversations… realized it was more after lunch in timing. So the two of us were eyeballing that online tracking like it was overtime of the Super Bowl. And then… it ticked over from “Out for Delivery” to “The Receiver’s location was closed on the 1st delivery attempt. A 2nd delivery attempt will be made.” But my Agent on the inside (name withheld because she’s a secret agent… duh!) went above and beyond to drive out and meet the truck and take delivery. I shall formally file a commendation in her agent personnel file. And now for some technical specs, because as a newer quilter (this is number 7) I find them helpful. 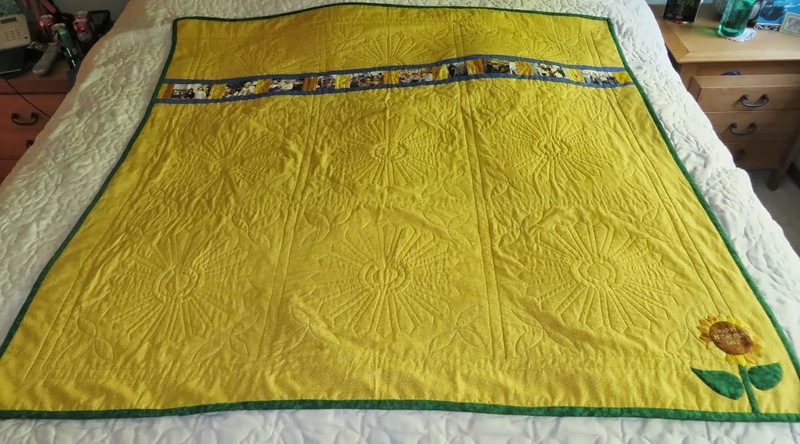 I used up nearly all of my 1/4 yard of each of the yellow petals fabrics, of which I picked out seven different variations. True 1/4 yards, not fat quarters there. I also used up 1/2 yard of the dark green in just the lattice work on the front, not including the border. I had originally thought I would do 18-20 inch squares, so I had some blue left over of the 2.5 yards I bought. Additional Photos in the progress gallery here.